To keep my mind off the waiting, waiting, I play bridge. 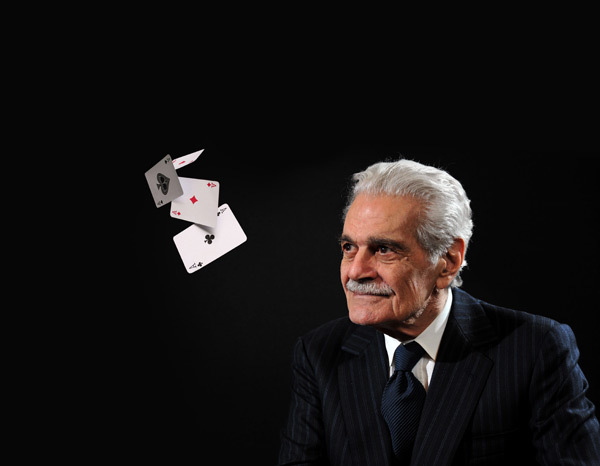 Omar Sharif represented Egypt in the 1964 Olympics for the game of contract bridge, according to one of the more benign rumors circulating about him on the internet. The secular trinity of Google, Google Books, and Wikipedia are uncharacteristically useless in confirming or denying the story, but the fact is, it just can’t be true, because bridge isn’t an Olympic sport. Bridge players have tried for decades to make it one, and in the late 1990s, the Olympic Committee recognized as it as one of two “mind sports,” along with chess. But the committee, which apparently finds curling perfectly tolerable viewing, has yet to be persuaded that the bridge is, in any conceivable sense, watchable. After considerable digging, I was able to trace the source of the rumor to a 1966 story in the Washington Post, which reported that Omar Sharif had captained the United Arab Republic’s bridge team for the World Bridge Olympiad of 1964. So much for the legacy media: there was indeed something called the World Bridge Olympiad, held every four years between 1960 and 2004, but the United Arab Republic — the short-lived union of Egypt and Syria — ceased to exist in 1961. Still, there is something apt about the bogus story. If anyone could have turned contract bridge into a spectator sport, it would have been the Omar Sharif of the swinging sixties. He was religiously devoted to the sport, occasionally refusing films if they interfered with his bridge-playing schedule. And he tried valiantly to bring attention to the game, even forming a barnstorming “Omar Sharif Bridge Circus,” a caravan of crack players who traveled the world playing tournaments and exhibition matches. Truly, there has never been a more beautiful, more glamorous bridge ambassador than Omar Sharif. The only way he might have given the Olympic Committee something to watch is if he had agreed to compete, like Olympians in the age of Pindar, naked. RIP Blake Edwards, Director of The Pink Panther Films.